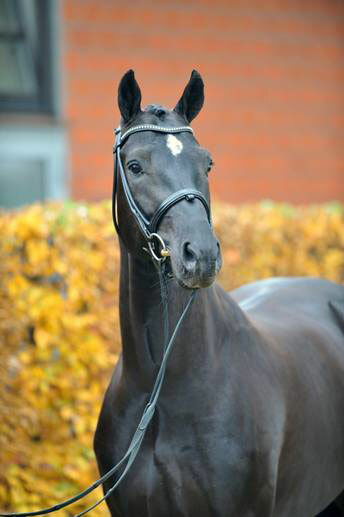 Dante Weltino, black Oldenburg Stallion, by (Danone I / Welt Hit II) born in 2007, standing approximately 16.2 hands. 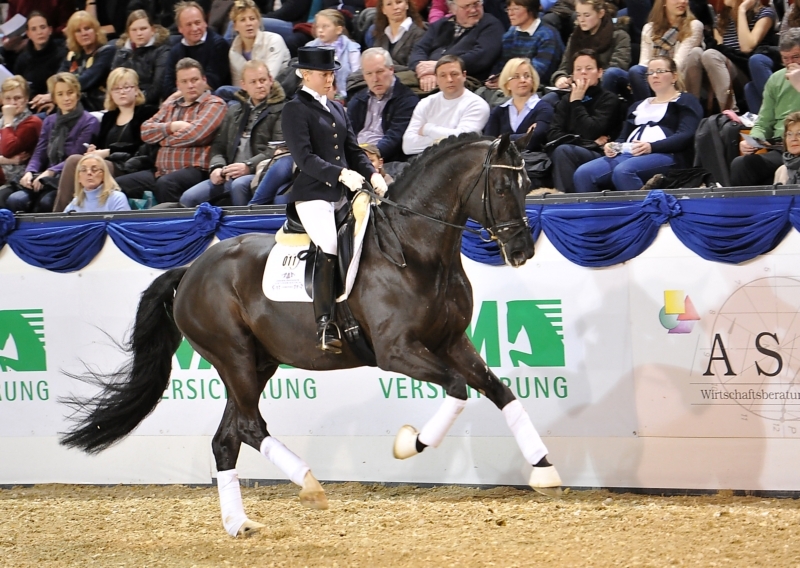 Dante Weltino , was acclaimed Reserve Champion of the Oldenburg licensing 2009. 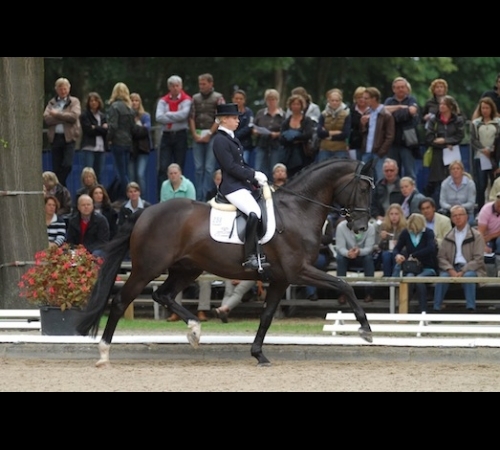 He has three outstanding gaits and shows great balance on the lunge,with excellent elasticity, coupled with tremendous acceleration. 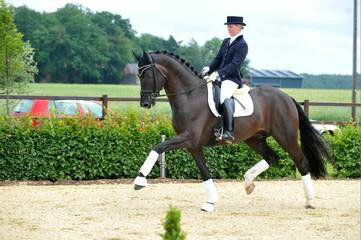 In 2012 he qualified for the Bundeschampionat, and was also approved by the Hanoverian Verband. 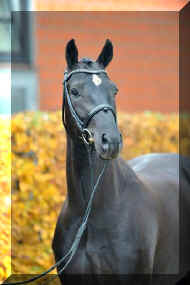 The father Danone I was winner of the Swedish licensing in Flyinge, qualified for the National Championships in 2006 and was in the final of the World Championships for six year old dressage horses ( see separate stallion page) . Meanwhile, he recorded successes in S-dressage. His descendants achieved top prices at auctions. 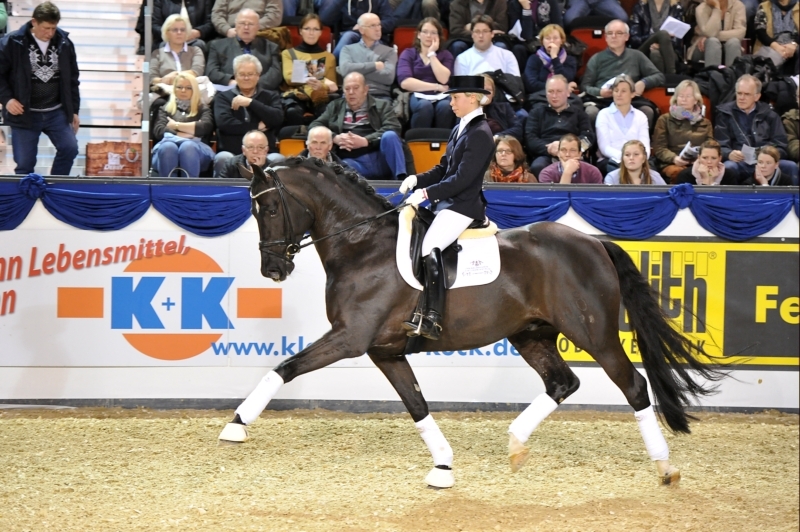 Three sons were licensed in 2009, including the 2nd most expensive stallion at the Hanoverian licensing ( 320,000 ?). Danone I also produced a performance test winner, Dankeschon. The mother Rihanna received the state premium. Grandfather De Niro has this year become no. 1 on the WBFSH list. 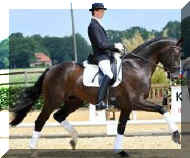 Dam sire, Welt Hit II, until his recent death stationed in the Netherlands, was victorious to Inter I. 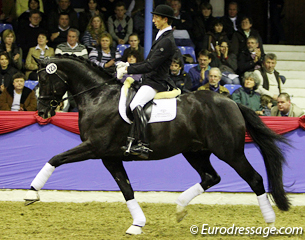 In the WBFSH list of world's best dressage stallions, he currently ranks 9th. The grandmother Verb.Pr.St. 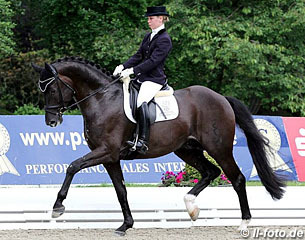 Riconess produced the jumping-national champion and winner Badenia Lumos (v. Lordanos) and the Brillantring and Dressage World Cup participant St.Pr.A. 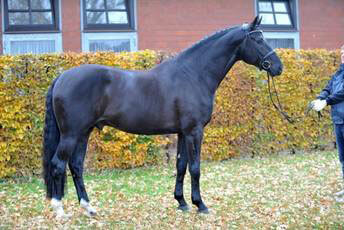 Riwera OLD (by Welt Hit II) - a full sister to Rihanna. From the great-grandmother Ricarda is the Oldenburg Champion Mare St.Pr. / El.St. Riconda (by Contender). 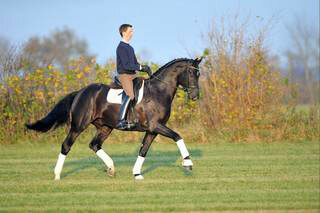 Dante Weltino will not throw a chestnut - he is homozygous for dark coats.